THE HESLOP HOUSE: MULTIPLE PERSONALITIES? CONNER WAS ATTEMPTING ONE OF HIS MULTIPLE FACIAL TRICKS, HE WAS TRYING TO GO CROSS-EYED, BUT HE HAS ONE EYE THAT WOBBLES BACK AND FORTH, AND THE OTHER ONE STAYS STRAIGHT. IT'S KINDA STRANGE, BUT QUITE AMUZING AS WELL. 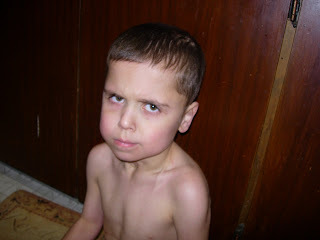 THIS IS ONE OF CONNERS MANY ANGRY FACES; SO SERIOUS! OUR LITTLE, WAIT BIG NOW, CONNER HAS BROUGHT SO MUCH JOY TO OUR LIVES, HE IS QUITE THE LITTLE CRACK-UP. HE WAS SHOWING ME SOME OF HIS MULTIPLE TALENTS, AND WAS QUITE PROUD OF HIS FACIAL ACCOMPLISHMENTS. 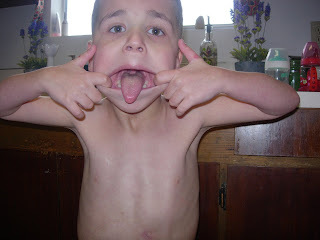 CONNER IS ALWAYS CLOWNING AROUND, AND IS ALWAYS UP FOR GOOFING OFF. Conner is so fun, he told Sean he was going to start drinking pop, just like Sean, because Sean drinks like one every day, little did Conner know he drinks way more than one a day! I think it's actually harder to keep one eye normal and one crossed than to do both of them crossed. He's more talented than he might even know. 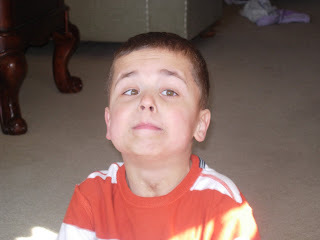 Believe me, I've been trying to master the lazy-eye trick for years :) Conner's such a cutie. I loved Amber's comment - how funny.